Amethyst is the modern February birthstone and the accepted gem for the 4th, 6th and 17th wedding anniversaries. In ancient times, amethyst was thought to be a strong antidote to drunkenness and was often set or carved into wine goblets. 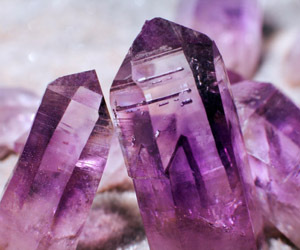 Amethyst is mined in Brazil, Siberia, Canada, India, Argentina and some African countries. A green variety of Amethyst, called Prasiolite, has become very popular in recent years.